There’s no better way to truly experience the laid-back Caribbean than with Princess. Our award-winning shore excursions and immersive Rhythm of the Caribbean program brings the colors of the islands to life. And with a wide variety of itineraries, we make enjoying multiple world-class beaches on one cruise possible. Known for world-famous beaches, stingrays and shopping, this is the perfect option for a sunny vacation reconnecting with loved ones. This unique destination includes the culture and ancient ruins of the Mayans as well as exciting eco-adventures, colorful coral reefs and friendly island locals. With a deeper dive into the Caribbean, you can immerse yourself in traditional Caribbean culture and life, on islands pairing colonial influence with native charms. See how easy cruising can be as you explore the Caribbean. Princess MedallionClass streamlines your vacation with everything from expedited boarding to drinks on demand, so you have more time to do what you love. Social media stars the Holderness Family recently set sail on a Caribbean cruise. 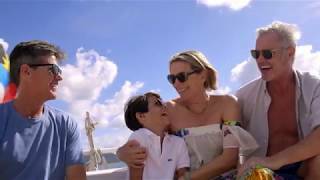 Check out the music video to see why a Caribbean vacation with Princess Cruises is more than just a trip! Want more? See the kids’ vlog of their experiences in Camp Discovery and adventures ashore, and watch the parents tackle cruise myths in their vacation recap. White powder sand beaches, perfect clear water, and sunny climes— it's the island idyll that earned Trunk Bay a spot as one of Condé Nast Traveler's Cruise World Wonders — and you can experience it with Princess. The culture and colors of the islands come to life the moment you step on board with our immersive Rhythm of the Caribbean program. Take a steel-pan drum lesson, meet parrots in the ship’s piazza, hear from treasure hunters, and enjoy live island music from local performers that will have you dancing all day...and all night long. Read about colorful cultures, breathtaking landscapes, must-see attractions and preparation advice for cruising the Caribbean. Few destinations boast as much sun-drenched tropical beauty or cultural diversity as the islands of the Caribbean. Get a taste of traditional Bahamian cuisine while on your Princess Caribbean cruise. Start your culinary exploration with these 10 Bahamian foods. Develop a plan and learn what to pack for a Caribbean cruise with Princess. Packing doesn't have to be a drag. We've got your cruise essentials covered. Learn a few tips for fishing in the Bahamas. Whether you're taking a Bahamas fishing charter or casting from the surf, Princess has what you need to know. Experience the 10 best Caribbean beaches during your next Princess cruise. There's no bad choice with these spectacular tropical beaches. Grab your mask and flippers and take a dive with Princess. Check out exotic fish, coral and other undersea wonders with the best snorkeling in the Caribbean.